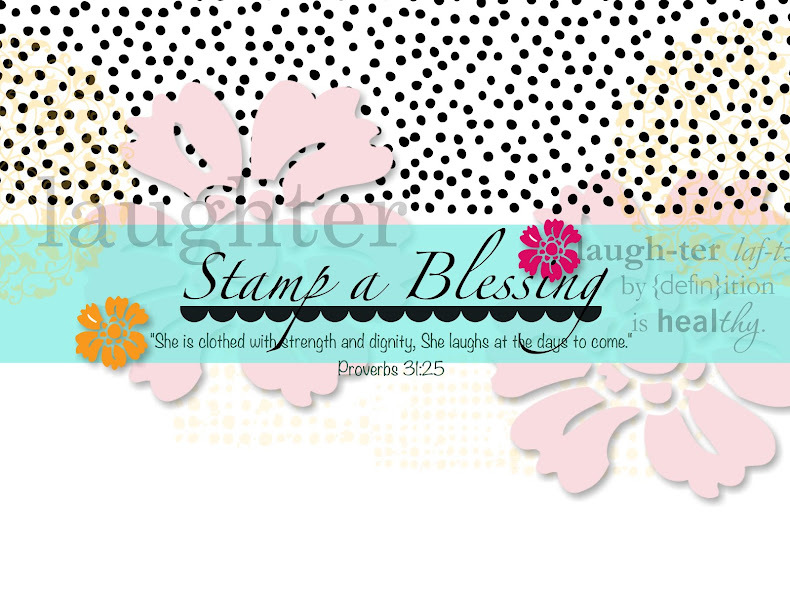 Stamp a Blessing: Make it Simple Monday PLUS a Giveaway! It's been a happy month so far. FULL, but happy! So many things going on but I am blessed and cannot contain the joy of sharing. I am SUPER EXCITED to share a sneak peak into our Use Your Stash class coming this Saturday September 15th. You WON'T WANT TO MISS IT! 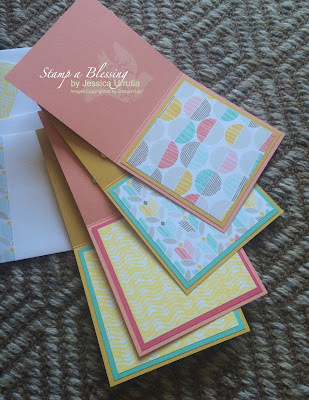 I am so happy I will actually do a giveaway of these beautiful cards WITH a retired stamp set, just because I want to see you making beautiful things with what you have. That is my goal! To INSPIRE, CREATE AND SHARE! 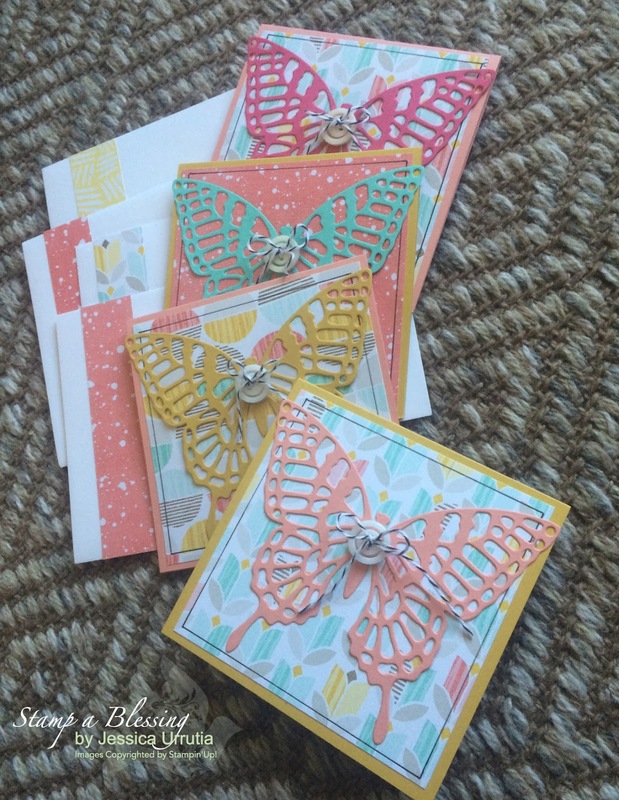 Leave me a comment below or on my Facebook group here answering What do you like about card-making? and you will be automatically entered to win this set of 4 cards! 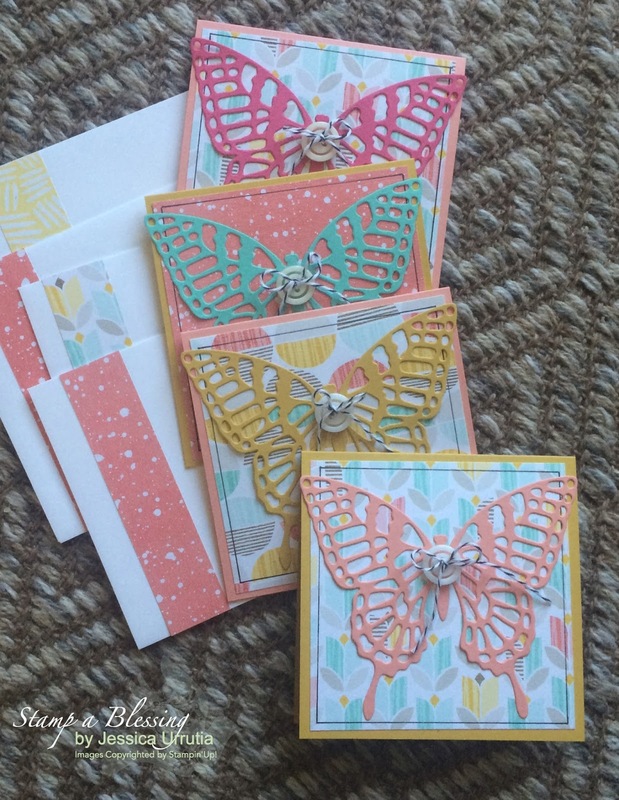 Butterflies goes well with any designer series paper and ANY sentiment stamp set. I used the Butterfly Basic framelits. GIVEAWAY winner will be announced Saturday afternoon! Yay! Will announce here and on my Facebook group! I am SURE YOU own many many beautiful papers and scraps everywhere waiting for you to ACTUALLY use them. Well, I will give you a few ideas below. Yay! More during our class this Saturday. Sign up! USE YOUR PRETTY PAPERS AS BACKGROUND for your die cuts. 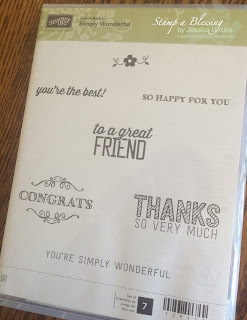 This beautiful set of notecards serves great for any occasion and ANY sentiment. Just stamp the occasion on the inside when the time comes. If you see closer I made a black frame around the designer paper with my Project Life pens. Size of cards is 4 1/4" x 4 1/4". Designer Series Paper (retired)-Best day Ever is cut to 4" x 4"
USE THE SAME PAPER OR ANY COORDINATING PAPER also on the inside of the card. 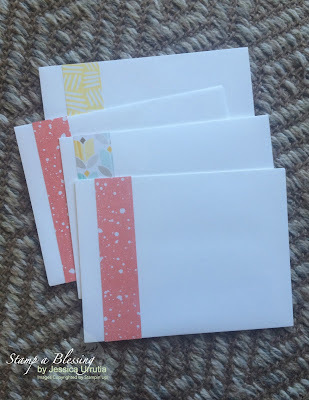 EMBELLISH YOUR ENVELOPES with a strip of the same paper. Don't' these look so neat and coordinated. 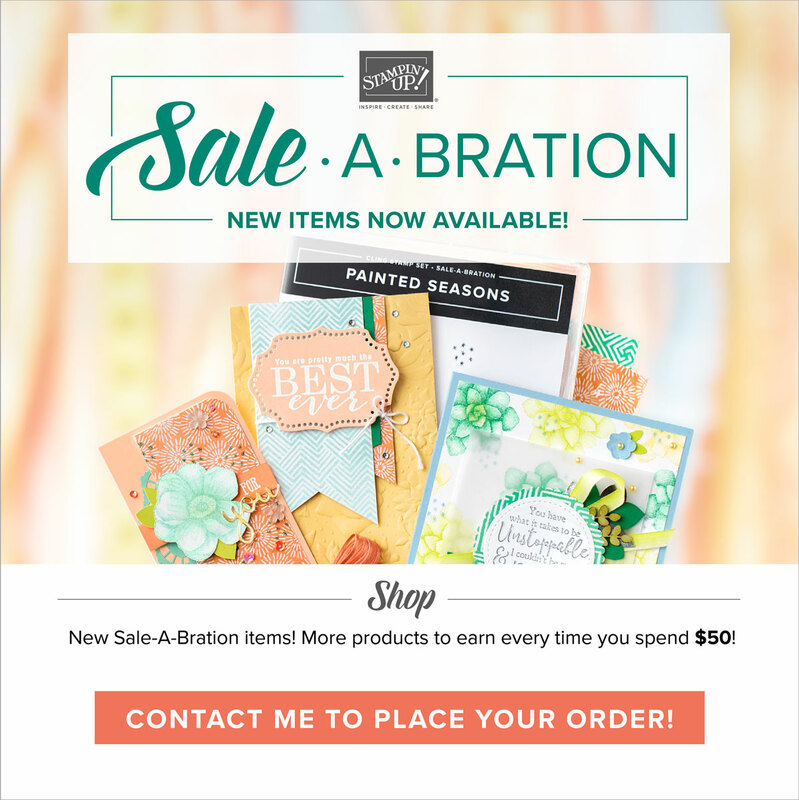 Hope my tips make your crafting easier and inspire you to use your stash of beauty you have laying around. Get it out and use it. All our pretty papers are TEMPORARY! Oh, my! Did I JUST say that? Yeap…..use them before they disappear. All things on the earth are temporary. Cool perspective aww…focus on the eternal but make an impact HERE in the present with what you are HOLDING in your hands. 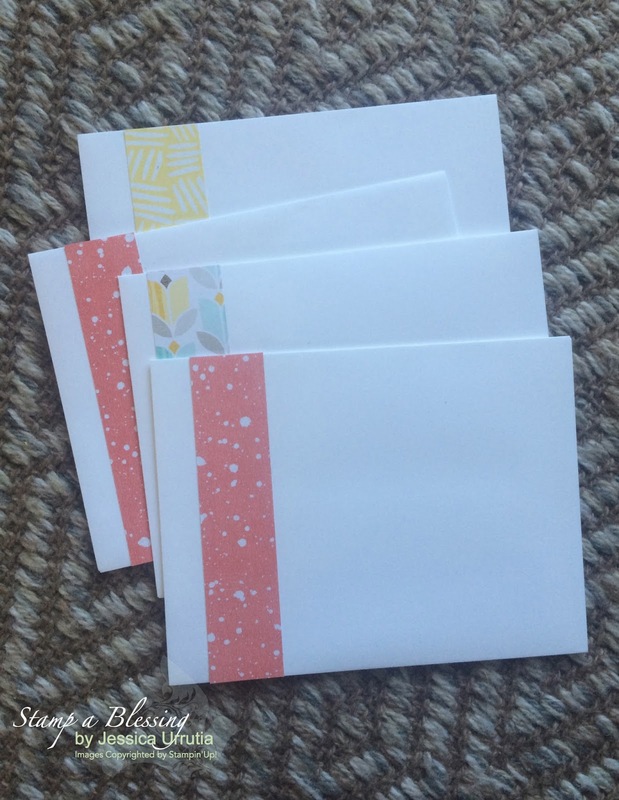 Whoever wins this set of cards will ALSO get this cute stamp set in the mail! 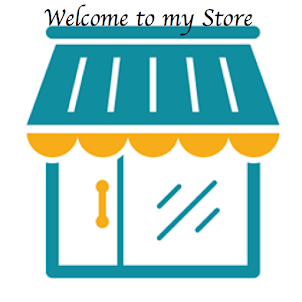 Tell me, what do you like about card-making? 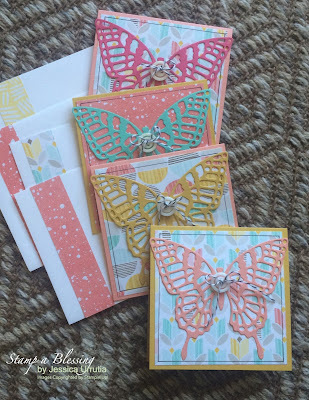 Comment below and enter to win my butterfly set, envelopes and this cute stamp set. Love you all! I told you is a happy day! Indeed Denise!! It does the same to me!! So interesting how making blessings for others blesses us too!